Embrace Malaysiana: Revolusi '48: Review of the "1st draft"
Revolusi '48: Review of the "1st draft"
Couple of weeks ago I went to the Emergency Festival to watch the screening of Fahmi Reza's Revolusi '48...Revolusi '48 is a sequel to the highly acclaimed 10 Tahun Sebelum Merdeka.If 10 Tahun Sebelum Merdeka focuses on the 1947 "Hartal"(boycott), Revolusi '48 focuses on why young proletariates join the armed struggle against our british colonial masters and focuses on the fact that the Malayan emergency is really a "WAR". Our british colonial masters used the term "emergency" because of the pressure from tin and rubber capitalists since their losses would not have been covered by Lloyds insurers if it had been termed a "war". 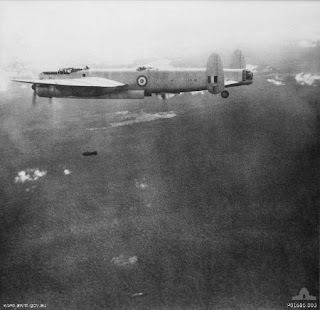 Just to say that this documentary is good is an understatement.The picture below shows a British bomber plane dropping 500 pounds bombs on communists targets in the Malayan jungle. In the film there is a foo tage of this plane doing just that.They don't show or mention anything about that in our "history" textbooks.That's how "good" the movie is! !The best part is this is only the first draft..
Fahmi decided the first draft just to gauge the response of the viewers.. You see communism and CPM(Communist Party of Malaya) is quite a taboo subject in Malaysia...However, at this day and age who cares really? ?we just want the TRUTH to be told and yes WE CAN HANDLE THE TRUTH.. The truth is although our ideologies differ, the fact remains that the 1948 revolutionaries fought and shed blood for our independence...during the Japanese occupation they fight alongside the british against the Japanese..the bloody brits even gave them medals for this! !and yes, there is also a footage in this documentary showing just that! !Just because the british capitalists is feeling pressure from the working class (because of the strong presence of the leftists in the labor unions).. They decided to outlaw the CPM ( Communist Party of Malaya) and the MNP (Malay Nationalist Party-a left leaning party) and detained them without trial.. This is all done to safeguard their interests in Malaya..
Dude, cmne nak tgk movie tu?